When I first discovered Innocent Bystander years ago, it was much less well-known than now. I saw a tiny review in the paper about their wood-fired pizzas and decided they were worth a visit; I haven't looked back! There is lots to love about this winery; the pizza, the tapas-style food, the desserts and of course the wine. They have the best Moscato around. We popped out last Saturday, a beautifully sunny winter's day that sees you going without a jumper for the first time in months. 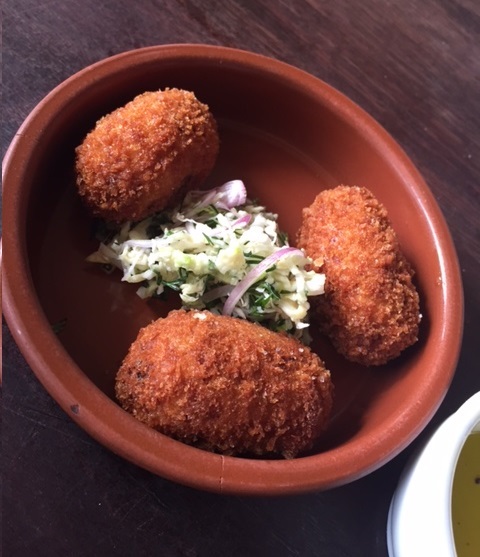 While we normally graze our way through the menu we decided to take things a little slower this time, starting with the house-baked sourdough (with salt and olive oil) and the smoked ham croquettes. One of our favourite wines to drink when we visit (aside from the Giant Steps Sexton Pinot Noir) is the Innocent Bystander Syrah. So smooth and easy to drink, perfect for lunchtime. The staff will also decant your red wine into one of their funky decanters. For mains we had pizza; the other half ordered his usual spicy pork sausage pizza. For some reason my favourites keep disappearing from the menu so I decided to try a new one: cauliflower and chorizo. It was very good, but I'm missing the four cheese pizza they used to do (hint hint). We also got a side of the house cut chips with aioli. I always feel a little naughty ordering chips and these hit the spot nicely. We decided to give dessert a miss, instead finishing off with coffees (or their amazing hot chocolate in my case). But I can definitely recommend the flourless chocolate cake, its a winner.